Fantastic result you guys. I'm sure the kids, the school, and the people of Romney and surrounds love having you there. 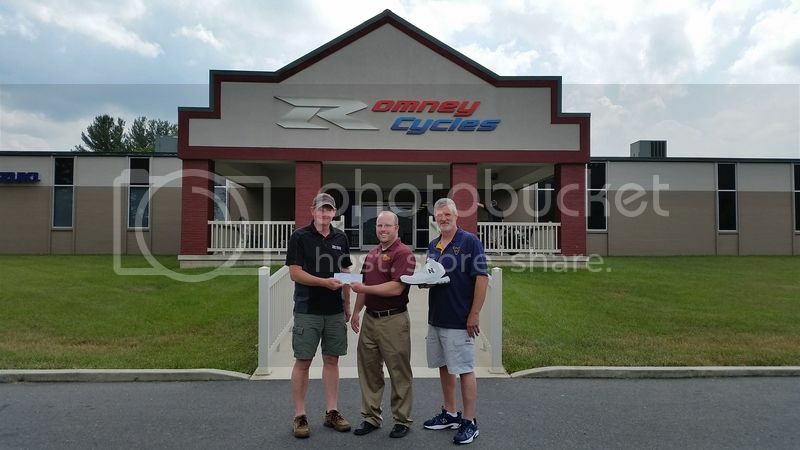 Congrats to the organisers, and to Romney Cycles - they really are great guys and pretty unique in the way they run the dealership. That first year, when we had 6 or 7 people, I was a little embarrassed that we couldn't raise the numbers to justify the effort and expense that Romney had gone to to accommodate us. Larry wasn't the slightest bit concerned "I expect we'll have 200 people show up within a few years". I thought he was being extremely optimistic. Shows how much I know - numbers could be in that ballpark next year eh? Already there, Trevor. They were told there were 200 meals served Saturday evening. Some of that was Romney staff, but there were more people there than the 163 that signed in. Today, Friday May 29th we presented the West Virginia School for the Deaf & Blind with money raised from our Adventure Riders. Mark Gandolfi & Bob Haines accepted the check on behalf of the school. They were excited to share that the donations would be purchasing all student Athletes new sports shoes for the 2015-2016 school year! We couldn't have done this with out our awesome Adventure riders! What a wonderful event with great support! Those kids participating in sports, just like everyone else's kids!!!! Couldn't make me happier thinking I supported such a thing. I happen to be one that believes LOTS of life's lessons are learned in sports. Bravo. Hi guys, I'm away from the computer most of the time for the next week or two. But Heather did send a photo to go with the news and wanted everyone to see it. ::012:: I am glad that I got to be a small part in this. It's a great feeling that such a community can help out and create such goodwill. It was worth every penny and more for me. Can't wait to go again next year. Good work Dirt Dad, Checkswrecks, Romney Cycles and all the others who participated and organized such a great event. I agree. Two manditory rides, Romney on the Tenere, and Star Days on my Stratoliner. Then depending on what the wife wants to do, is there Vacation for the AR (so I confuse AK and AR!) ralley? Then depending on what the wife wants to do, is there Vacation for the AK ralley? Since I cannot spell I use spell check. However it has no idea i wanted to abbreviate ArKansas and assumed I was correct with AlasKa. Good explanation BigBob. But you must now come to ARkansas via Whitehorse AlasKa. Wanna borrow a GPS? BigBob sent me a PM the other day asking if I was going to the AK rally. I PM back saying "what rally" Now I know what was going on. And Whitehorse isn't in AK Snake, It's in Yukon T.
Snake you want to ride to Whitehorse with me next year? But we do have to make it to AA or AR or AK OR whatever is up there. That will be either my 49th or 50th state. Depends on the wife and I making it to HH or HI or whatever state is that small swim west. And I do have a Garmin 665 on my bikes. For the trip north I will move the XM antenna from the Strat to the Tenere so I have live weather and radar right in front of me. It'd be my honor to go to Whitehorse with ya BigBob. But not at "eemsreno pace". You know me, I take a month to get to Romney and back. Darn I still need to find somebody to go with. I do NOT have unlimited time as I still have a day job and Steve can ride slow! After all he taught us both the 11 MPH crawl! I will talk to you at the AK rally (That state north of Texas but south of Missouri) if you are there about going to AR (the state north of Whitehorse) since I really want to put an ALL 50 patch on my Star Vest. I find these things out the hard way. You just keep making it easier for me Steve. Teacher.